Business, culture, and competitive landscapes have fundamentally changed, but basic principles and best practices for succeeding and future-proofing both yourself and your organization haven't. With a mix of compelling stories, research from the social sciences and psychology, and real-world insights, Make Change Work for You shows how to reignite your career, rekindle creativity, and fearlessly innovate your way to success by providing the tools needed to master uncertainty and conquer every challenge in life or business. 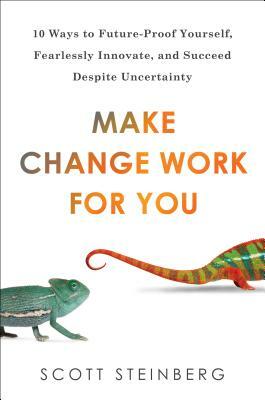 Make Change Work for You opens with a comprehensive overview of the most common factors that lead to self-defeating behaviors, including fear of failure, embarrassment, underperformance, rejection, confrontation, isolation, and change itself. Focus: Define the problem and come to understand it objectively. Engage Interact with the challenge and try a range of solutions. Assess Review the response(s) generated by your tactics. React Adjust your strategy accordingly. Scott Steinberg is among today's leading business strategists and strategic innovation consultants, as seen in 600+ outlets from CNN to Time and The Wall St. Journal. The CEO of management consulting and market research firm TechSavvy Global, he helps clients create value and cultivate competitive advantage on the back of emerging trends. A top-rated keynote speaker, popular author and futurist, he provides presentations and training workshops at events, meetings and conferences. Among today's most-quoted industry experts, as seen by over one billion people worldwide, Scott's 10+ year track record for accurately predicting business and consumer trends has made him a fixture in mainstream media. He has been a featured guest or contributor to programs on ABC, CBS, NBC, CNN, ESPN, and MTV, and columnist on change and innovation for Fast Company, Rolling Stone and The Huffington Post.